• Hundreds of facts, stats, quotes and events in a deluxe 12x18 format – Every day of the year has a reminder of The Mick’s legendary career. • Exclusive This Day in Mickey Mantle History entries or a fact, stat, photo, headline or quote for every day of the year. • 13 new monthly feature photos, both duotone and color, digitally enhanced to bring new life to each one. All are captioned with a story in The Mick’s own words. • Dozens of unique, rare and seldom seen photos. List priced at $14.95, this superb collectible is offered for only $8.95, a $6 savings! A highly regarded item prized among collectors. Order yours today while supplies last! Order here or call 1 800 THE MICK (1-800-843-6425). CLICK HERE to learn more! 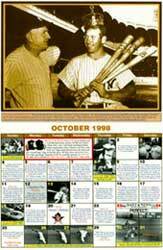 See photos and sample pages from the 1998 Mickey Mantle Photo Calendar - Fact Book.